We have three yurts and a Gypsy Caravan spread over 1 acre so there’s lots of space and privacy to really chill out. Glamping open May-September. Prices include all bedding (excluding towels) as well as fully equipped kitchen and outside fire-pit. Price includes all bedding (excluding towels) as well as fully equipped kitchen and outside fire-pit. The campsite will be open from April 18 until October 1st. 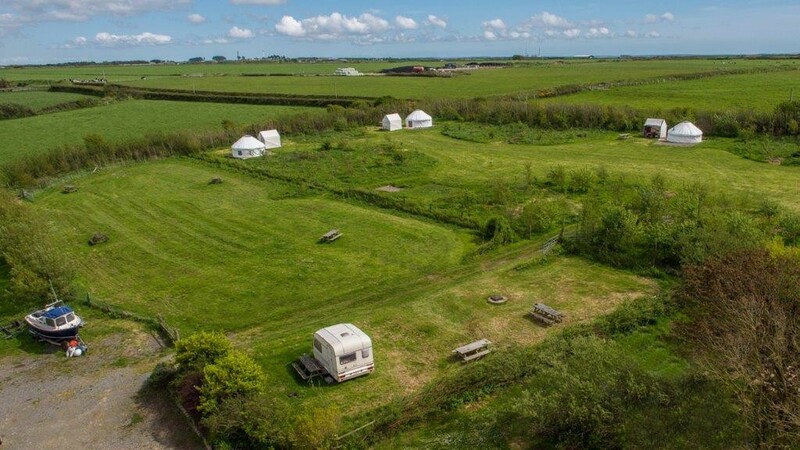 We have eight open pitches spread out over around two acres, There’s lots of space and privacy to really chill out. Please check with us about Gazebos, extra large tents, awnings, trailers, boats and other camping bits and pieces. Campfire wood is for sale on site – or you can bring your own. All prices are inclusive of picnic table, fire pit and hot showers.